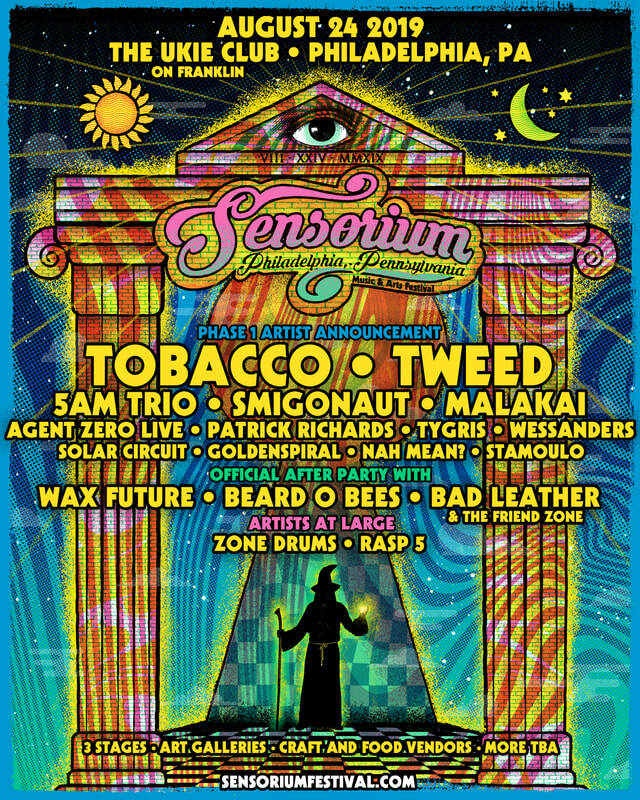 Philly’s SENSORiUM Music & Arts Festival has announced the phase 1 lineup for their 2019 event in Philadelphia and will feature a massive variety of musical acts, local vendors, artists, and performers. This year’s all-day festival, hosted by local Philly promoters and electronic-rock quartet Tweed, will be held once again at The Ukie Club in the north side of the city, and features music from noon to 2am on Saturday, August 24th and into the hours Sunday morning. Phase 1 acts for 2019 feature a headlining performance from TOBACCO, aka Tom Fec, who has recently collaborated with Aesop Rock on the acclaimed late 2018 release and project of the same name, Malibu Ken. He also created the bass-addled theme song for HBO’s “Silicon Valley". The event also boasts sets from Philly’s own Tweed, 5AM Trio, Smigonaut, Malaki, Agent Zero Live, Patrick Richards, Tygris, Wessanders, Solar Circuit, Golden Spiral, Nam Mean?, and Stamoulo. Following the music on the outside stages, the official after-party will take place indoors from 10pm-2am with Wax Future, Bad Leather & The Friend Zone, and Beard o Bees (Jesse Miller of Lotus), as well as a takeover stage with DJs from New York’s The Rust music label. Artists-at-large include Zone Drums and Rasp 5. “We’re so excited to host TOBACCO’s return to Philly,” said Tweed drummer and SENSORiUM event director, Joe Vela. “The overall talent on this event is insane and it’s an honor host all of this music and art in one day in Philadelphia.”​ In its third year, Sensorium will have spacious grounds with 23 acts featured on three stages along with art galleries, art installations, and craft & food vendors. Stay tuned for the Phase 2 lineup coming soon.